Have any questions about our epoxy floors or concrete floor services? read our frequently asked questions below. What kinds of flooring materials are best for my space? At Blackrock Industrial, we use only the highest-quality flooring materials for our terrazzo and epoxy floors, supplied and manufactured by the most reputable product manufacturers in the world. The products we use are all produced by manufacturers such as Laticrete, Koster USA, Advanced Polymer Technology, NeoGard, Carboline, Flowcrete, Florock, Arizona Polymers, General Polymers, Tennant, Euclid and Kelmar, to name a few. All of the products we use are strictly produced for commercial and industrial grade applications. This is what ensures proper installation and limits the exposure to potential product failure down the road. How do I know what the best flooring system is for my space? The flooring system your space requires is dependent on the environment and the performance features you desire. 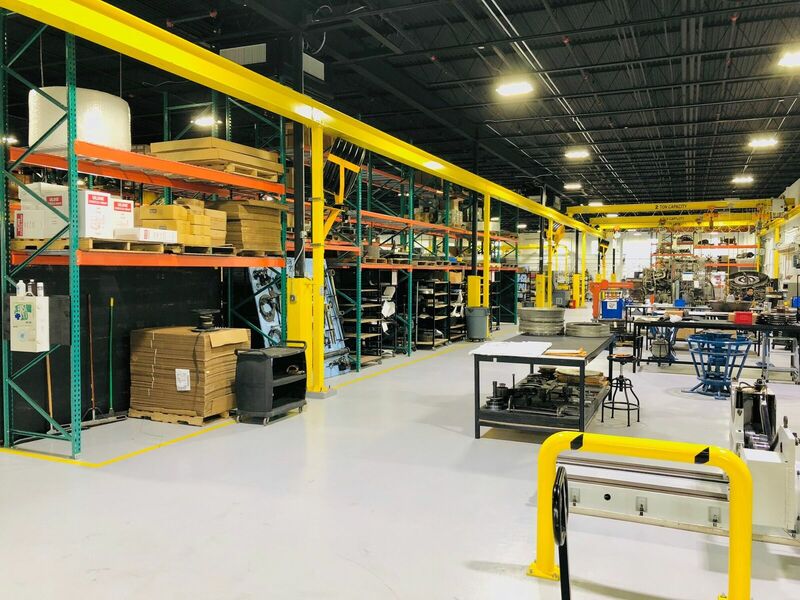 At Blackrock Industrial, we are trained to evaluate and assess the specific needs of your space, covering all aspects of cost-effectiveness, durability, safety and overall performance. We work with you directly – formulating and designing the floor that meets all of your objectives. Are epoxy floors resistant to moisture? There are certain products and system components that are resistant to moisture. If your facility requires moisture resistant products, they can be furnished and installed according to the necessities of the installation. Are epoxy floors resistant to chemical exposure and acids? Yes, and no. There are certain products, topcoats, sealers and components that are resistant to chemical and acid exposure. Depending on the prescribed needs of your installation, these products can be furnished and installed accordingly. How much lead time do you need to schedule my project? We generally ask for a 10 – 14 day lead-time in order to prepare for your project. For urgent or emergency projects we try to figure out immediate and aggressive ways to accommodate our customers and solve their problems as swiftly as possible. It depends on the system you are looking to install, its technical specifications and the size of the project. Typically, projects range from 4-7 days. As a general note, take a look at how many coats of material we suggest installing in your facility. Each coat will take one day to install, generally speaking. How long will the epoxy flooring system take to dry? It depends on each product used. 12-hours after completion is a good starting point in regard to foot-traffic. However, you should wait as long as possible, depending on your operational requirements, prior to moving heavy equipment back into the space. 12 Hours for Foot Traffic. 72 Hours for Equipment and Automobile traffic. Who conducts the flooring installation? We do. Blackrock Industrial does not, and never has, used the assistance of subcontractors to perform any work entrusted to us by our clients. Everything is done in-house with our full-time employees. At Blackrock, we conduct the full concrete preparation of your slab, whether it be shot-blasting, diamond grinding or scarifying. We then repair any imperfections in your concrete slab and move on to our installation process. Concrete floors are our canvas to work on. It’s our job to make sure everything is perfect before we proceed with the application of the epoxy or concrete flooring system prescribed for your space. Do you guarantee your epoxy flooring installation? We stand by our products and workmanship 100%. Every system we offer carries differing warranty periods and stipulations, depending on the environment of your space and system chosen. What kinds of epoxy or concrete flooring projects can you help with? Any. We specialize in epoxy floor coatings, concrete overlayments, concrete leveling and repair, decorative concrete staining and polishing, polyurethane and epoxy injections, traffic deck coatings, and many, many more. If your project requires the use of any sort of specialty polymer or polymer concrete, we are the company for your job. Will the installation process affect my company’s operation? We are an organization that is committed to working with our customers directly and are dedicated to coordinating our project to work around our customers’ schedules in order to prevent the interruption of daily operations and productivity. We will install our installation around the times and schedules agreed upon with our customers, and ensure proper and thorough communication is administered throughout the entire process in order to keep all parties on the same page. How safe are the products that you use? Truthfully, it depends. We try to use only the safest products on the market, but there are instances where products with high VOC and odor must be used, depending on the situation. In these instances, we recommend that customers remain out of the space during our installation, unless they are properly equipped with respirators and appropriate breathing apparatuses. However, in most cases we use high-solids resinous materials, which means that flammable or toxic fumes will not be a problem during the installation process. How do you properly maintain an epoxy flooring solution? Proper maintenance and cleaning of your floors will guarantee more durability, better aesthetics and prevent surface degradation. Factors that impact your floors can vary, but simple maintenance practices can make a big difference. We ensure to provide our customers with all the Technical and Safety Data Sheets for the products we use, which all contain small blurbs on the proper maintenance procedures for those particular products. Clean your surface with a neutral-based cleaning agent. No Ammonia. No Chlorine. Clean traffic areas daily and thoroughly to reduce wear and degradation. Pick up any spills immediately to prevent discoloration or staining. Select the right tools, equipment, and mop heads for cleaning. We tend to recommend microfiber pads. After some time, and closer to the expected termination of the flooring system’s lifespan, we recommend considering a simple recoat. This will help to prevent unnecessary expenses associated with having to redo a floor. When an epoxy floor coating is starting to diminish 5-15 years later, a simple recoat can do the trick and save a lot of time, hassle and money. Can you pressure wash an epoxy flooring system? You can, depending on what products have been used. Pressure washing is, generally speaking, not an issue. If you are pressure washing your flooring system with water in excess of 120 degrees Fahrenheit, you can damage the installation. There are specialty products designed to withstand temperatures up to 240 degrees Fahrenheit, however.